This drawing is a copy of the original sketch. On the back of this sketch is the following. Drawn from one of Perelle's Landskips. Joseph Pocklington (1736-1817) was the younger brother of Roger Pocklington (1734-1810). Joseph had many building enterprises including Carlton Manor 6 miles from Newark. Roger was well known for completing the building of Winthorpe Hall, which was started by Dr. Robert Taylor. Gabriel Perelle (1604-1677) was a French artist on nature, waterfalls, buildings and landscapes. He had two sons, Adrian and Adam. A collection of his work, six etchings are in The University of Delaware, Newark, U.S.A.
One of his works is a building with a stone bridge. Landskip is an old word for landscape. Many years ago rich people went on the Grand Tour of Europe and which would last many months. They took with them their families, servants and tutors. They were able to bring back many items such as statues and paintings to decorate their large houses. They would also bring back ideas and designs from the French and Italian gardens. Stonemasons and painters would also be engaged. 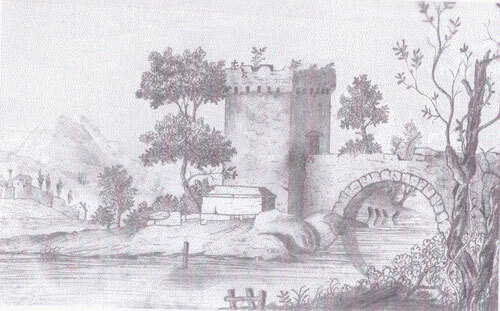 It is believed that the Pocklington family were on one of these Grand Tours, when Joseph Pocklington was able to sketch this landscape scene from one of Gabriel Perelle's etchings. This sketch was found in a auction job lot by Mr. Francis Shaw of Langford Old Hall, Langford, Nottinghamshire. He presented the original for The Village Scrapbook in June 2004. Roger Pocklington in Volume 4. The Pocklington Brothers and their buildings in Volume 4.